The poor Flemish. We can only assume that the famous French poet would be pleasantly surprised to see how far it has come since he visited the tiny European nation. They made it to the quarter-finals, for God’s sakes! They can’t be all bad! Conceptual poet Marjorie Welish was next to emerge from the Conjunctions’ batting cages. Lyricism of this sort – in her reading, Welish employed incongruities, halting rhythms, and innovative line breaks as a means of interrogating language – is difficult, but rewarding in its difficulty. One must lean in close to catch every syllable, and then even closer. Welish read intently and with a clear appreciation for sound, slowing down at times to emphasize line breaks in mid-sentence and even in the middle of words. Linguistic conventions were slashed, inverted, and melted down in a kind of poetic smelting. Writing like this takes concentration and, more often than not, a second reading for an audience to fully appreciate it. Conjunctions editor Bradford Morrow approached the podium demurely and introduced the third and final reader of the night, the Havana-born Hache G. Carillo, author of the 2005 novel, Loosing My Espanish. 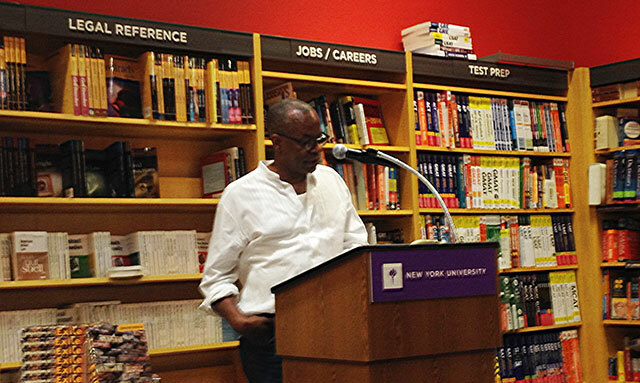 Carillo acknowledged the theme of the issue – Exile – in which excerpts of his novel-in-progress appear. 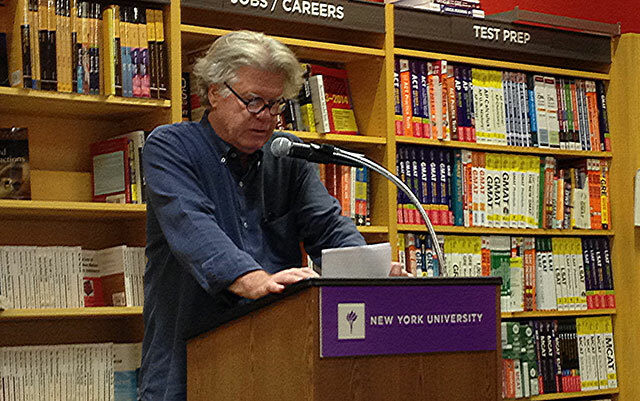 Calling his piece a “novel-length essay” on race, gender, and ethnic identity, the author proceeded to read a series of wonderfully vibrant and exuberant passages that demonstrated a rare proficiency in the challenging arena of bilingual literature. Ricky Ricardo appeared briefly in the text and allowed Carillo to touch on the infuriating and sometimes hilarious misunderstandings endured by multi-ethnic, multi-racial individuals in a world that often seems slow to understand them. The bright and tidy setting of the NYU Bookstore struck quite a different chord from the sultry half-light of KGB Bar on East 4th Street, where Conjunctions last popped up in New York. Instead of a dewy 28-ounce bottle of Baltica ale, hummus and veggie platters with crackers. Not to mention complimentary Perrier and soda? Don’t mind if we do! It was, admittedly, difficult not to feel satiated on such a balmy summer evening, with the trees dipping their branches lazily over the East Village sidewalks, but a successful journal launch only helped to distribute further the good feelings. If any Belgians were in attendance they opted not to speak out, which suggests that they are, as we suspected, good sports after all.